This Mailbox Post Adjacency Merchandising makes sure you don’t overlook the obvious. Yes you can be sophisticated and employ a plastic, steel, or fully assembled mailbox and post. But the simplest solution is the pressure-treated post in the foreground. 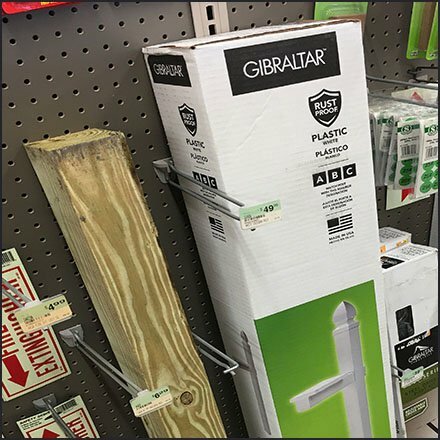 Normally available in the lumber yard back-of-store, this in-store adjacency reminds of this basic offer. And comparing the $49.99 Plastic Post to the $6.29 Pressure Treated Post gives one pause. Most of my mailbox posts don’t fail from age or materials, rather are run down by passing cars, trucks, and snowplows. Maybe the cheapest and most expendable solution is the best. Price comparison is made possible by Straight-Entry Scan Hooks which also serve as Dividers. This Mailbox Post Adjacency Merchandising seen at Conyngham Builders, Conygham PA.